Wisdom is not easy to find. It is buried in the roots of our living. Nature is a space where wisdom does not know bounds in the way humans often place them around phenomena. I like this except …. We can learn a lot from Nature by observing and studying it. But we aren’t likely to learn anything from Nature by anthropomorphizing it. Nature doesn’t have conscious intention; Nature does not chose. 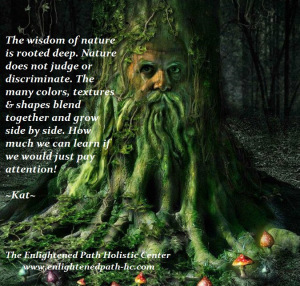 How does it make sense to say Nature does not discriminate when Nature does not choose? It just confuses things and stunts genuine efforts to learn from Nature. We place ourselves in the centre and treat nature as a possession which we can dominate. When we step back and just let things be, we can open up and learn. It is. You are welcome Doris. Nature has so much wisdom to offer when we stop and allow it to teach us. Thanks for sharing. Thank you so much for sharing this out & have a blessed holiday! You are welcome and thank you Lorraine. Take care and enjoy the holidays. Peter Levine wrote about prey animals,surviving an attack, stopped and released the trauma experienced from this near death experience. Man is the inky animal,who,stores trauma. We possess judgement. It is like property we can own and we end up mistreating the property unable to let go.